In the time of Instagram and selfies, many users want to make their photos more beautiful. 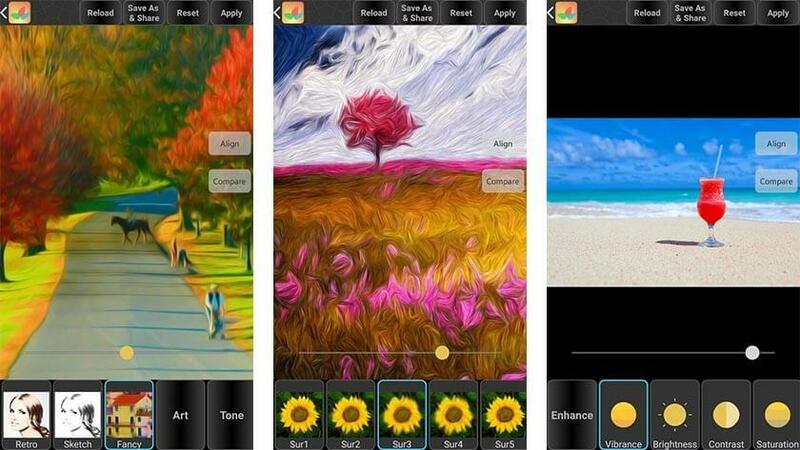 All you need is a suitable image editing app for Android. We've got a whole list of the best apps, plus a new addition for adding Instagram-ready graphics to your photos: Canva. Here, we’ll tell you which of these are the best. From the makers of Pixlr-O-Matic also comes Pixlr. This application is specifically designed for editing photos, allowing you to quickly prepare sharp, attractive images and then share them with your preferred social networks. You don't have to be a professional to get good results with this image editing app. There are many effects, cosmetic treatments (removal of red eyes, brightening and smoothing) are available, and connections to social media channels are all included. For your more frequently used settings, you can create buttons for quick access. A separate collage mode also helps you combine multiple pictures into a single image. Snapseed is Google's own photo editing app and it pretty much has it all: it's free and offers all sorts of filters and optimization options. Whether trimming, applying filters or correcting colors, with Snapseed you have a powerful picture editor in your hand. You can adjust the coloring or, for example, create a focus effect, although not to the standard of a DSLR – but the images can be greatly enhanced. Snapseed saves your pictures in a separate folder, that way you can avoid modifying the original image. With apps like Dropbox or Google Photos, you can also synchronize these with Snapseed. For many people, Photoshop is synonymous with photo editing. After the first touchscreen version of Photoshop was removed from the Play Store, Adobe started to launch its own app offensive. For photo editing, there are two apps that deliver good results: Photoshop Express and Photoshop Fix. Photoshop Fix specializes in working with photos and you can use all of the essential features of Photoshop to get the most out of your photos - fit proportions with the liquifying tool, retouch photo defects or adjust details with controls for dynamics and clarity. Photoshop Express, on the other hand, has a larger range of functions and can also handle RAW formats that are more likely to come from the DSLR camera field. Another interesting app from Adobe and is called Aviary. Aviary provides you with a variety of effects and helps you to quickly generate a meme from a picture of you. SKWRT focuses on correcting the perspective of a photo. Upload a photo and it will then correct the perspective at your discretion. The options available for this are numerous, and allow you to easily correct horizontal and vertical lines. Although SKWRT cannot produce miracles, your photos will look considerably straighter after editing. Vignette is not purely a photo editing app, but rather a hybrid that also serves as a stand-alone camera application with digital zoom, time-lapse and a self-timer. The focus of the app is on vintage effects and camera styles, so you'll be able to make your pictures look as if they were shot with a Lomo, Diana, Holga or Polaroid. There are also double-exposure and photo booth modes. Photo editing with Vignette, however, is limited to the camera effects, as cropping and rotating are not possible. In contrast to many other applications, the full range of functions is also available without a data connection (as it should be). The pictures remain on the smartphone – unless you share them somewhere. More and more camera apps control the output using raw data. This means that sensor data from a snapshot is stored on the internal memory without any post-processing. This post-processing then takes place in an app like Adobe Lightroom. Lightroom has been available for Android for quite some time, but it is only now that it is developing its full strength. Finally, you can take full advantage of the photo app without an account in the Adobe Creative Cloud. Only the synchronization of your photos via Adobe services requires an account, as well as a valid subscription. When you start the photo editing application, you will not see any pictures. So the first step must be to add the existing gallery images to Lightroom. These will then also be available to see in the Lightroom collections. The possibilities for manual or preset-based post-processing are numerous. The support for raw data images is, of course, remarkable. Only the DNG and RW2 formats are used here. You can use any editing steps that are available on the desktop. Thanks to the integrated camera, you can also integrate mobile photography into your Lightroom workflow. The app syncs images with the Adobe Cloud. Google Photos is an all-in-one solution: you can use the app to save the images to the cloud to free up space on your smartphone and, of course, you can edit the pictures too. For the latter, you have several filters which you can use for the optimization. Contrast, saturation, or other parameters can be adjusted quickly. One disadvantage is that when you save the corrections directly in Google Photos the original is overwritten, which is not always desirable. All in all, the sorting functions of Google Photos are quite convincing. The app sorts photo materials by people, places and important features. This way, you can find certain holiday pictures or selfie portraits faster, without having to scroll through the entire picture gallery. Added to this is the unlimited photo storage in Google Cloud, which is available for photos with a resolution of up to 16 megapixels. Candy Camera includes many filters and even stickers to decorate your photos. In the absence of limitations it is possible, among other things, to eliminate or smooth over skin impurities directly on the image. In addition to standard filters, selfie filters supplement the already large selection. The effects are cool, so that even photos taken in the office or under a cloudy sky look as though they were snapped beneath the sun. Hundreds of stickers round off the whole thing and make for a bit more fun. In any case, you should try out the app. Facetune is an image-editing app that helps you make your selfies and other images more beautiful. Whether it’s pimples, wrinkles or dark circles under the eyes, numerous editing possibilities are offered by the Facetune app. Even a not-so-perfect smile or discolored teeth may be retouched. If you want to give a new look to your photo subjects, you can also change the eye color, sprout hair on bald spots on the head, or even adjust cheek and jaw bones. Facetune also offers numerous filters, so you can improve your photos with special effects. Cymera is designed specifically for portraits, although any photos can be edited with it. Images can be taken with the smartphone camera or selected from the gallery. The image editing app offers seven different lenses and four shooting modes while taking pictures. More than twenty filters, decorative effects, portrait features and realistic makeup effects are available. Images can be shared over Facebook, Twitter, Tumblr and other places directly from the application. Cymera is free, but is not free of advertising - a small, tolerable banner is shown at the bottom of the screen. You don't need Photoshop or graphic design skills to get your photos Instagram-ready with the Canva app. As many other apps do, it can take care of photo editing and filters, but that's not what makes it special. With 60,000 templates, you barely have to make an effort in order to create pro quality graphics for social media, collages, posters and more. And, there are over a million stock photos at your fingertips in the app. If you don't want to use your own images, it comes with access to over a million stock photos built in. Spruce up your images, create your own graphics and wow your friends with Canva. Photolab Pro has a large range of functions, but in this review it really scores high with its filters. Similar to the Prisma app, you can create paintings from your photos. That said, Photolab Pro goes much further as it can create different montages, which give your pictures a whole new look. It’s easy to use, so you can get results in just a few steps. Instead of more perfect details and colors, you get a whole new subject here. The free version works slower, builds a watermark and displays advertisements. With this app, you can turn your panorama pictures into a so-called "Tiny Planet image". We recommend two apps for this: the first is called Tiny Planet FX. Unfortunately, the application is not free, but it offers many options to adjust the effect accordingly. The second app is called Small Planet and is available free of charge in the Play Store. The apps require a little training time. After that, the user can create spectacular pictures. If you've been able to deduce anything from our review its that if are not satisfied with a smartphone photo, there are a whole series of apps to help you tweak the finer details. You can retouch photos – the various Adobe apps have the best tools here. Pixlr, Canva or Aviary will allow you to make quick montages and collages. In our review of the various apps, the Adobe apps appeared to be useful mainly for detail work on images; playful effects were implemented quite well in other apps. Photolab requires little prior knowledge and conjures up fast results; the Small Planet effect, on the other hand, creates astonishing reactions to your every social post. Are you customizing your own images? Do you have a favorite app for reworking your pictures? Let us know in the comments below! androideditors is using Hatena Blog. Would you like to try it too?